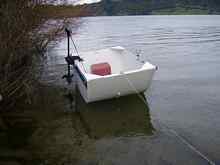 A simple practical little row/sail/electric motor floating fishing barge designed by me. I was going to design the D-5 as a One-Sheeter for my free boat plan group at Yahoo - One Sheet Wonders, but it wasn't possible to get what was needed out of one sheet of plywood. I wanted a 5ft floating dock/fishing barge that I could anchor just out from the beech so I didn't have to wear fish waders on protected waters for fishing, or use it to explore along the shoreline. 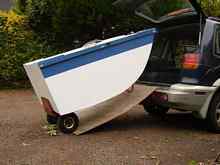 I'd been toying with the idea of designing a small boat that was simple and practical for Greg a member from One Sheet Wonders who needed a design that could carry a heavy set guy that would provide ample free board and fit in the back of a SUV/Van. The D-5 was designed for the home handyman to build using materials that could be found at the local hardware shop. Like any major city, pushed for room if you cant build outwards, build upwards. If you don't have the space available, it's 5ft lengthwise. I made the sides 2 ft and beam 3ft. The D-5 is very responsive being only 5ft. You can spin her around in the water very easily. Rowing this boat is like a Tortoise - its a rocking motion bow up and down. Its the most unusual boat I've been in performance wise. I'ts not like any normal boat. A dagger board or skeg would be advised to give direction. I also intend to try a sail. I imagine it would be the worst performance under sail I've ever encountered, but would be fun to try. I would have to add floatation. 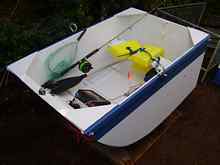 Maybe a plastic fish tray bungy corded to the front area inside the hull in-case of capsize. It can be transported using a trolley, the kind readily available at hardware shops instead of a trailer. Just strap the D-5 on and wheel into the back of the SUV/Van and off you go. Also, a standard cheap trap provides shelter against light rain with a simple tent like centre frame as an option. Also, an anchor wheel wind set-up could be another idea since there is little room to move about. Because the seat is located at the transom, end weight distribution needs to be personalized to the individual. 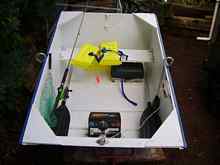 To bring the bow down I put my battery for the electric trolling motor up front to balance out the weight distribution. I have yet to work out free-board. A more accurate guesstimate as to how much gear and person she will hold, but 700 lbs sounds about right as the max out. Considering 2ft sides is more than enough to give free-board to whatever one person might want to carry, I'd say you could load up within reason anything you might need gear-wise. The D-5 carries allot for a midget. It's like the little train that could, a pint size vessel that packs a real punch when its all round practicality is put to the test. 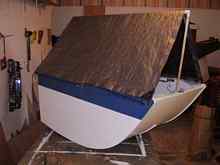 Its easy to build - nail/screw, waterproof glue and latex house paint will fix it together in next to no time and in water you go. For further info and free plans go to DRAGONFLYPUNT where if need be you can get help and info on your build from myself and other members building the D-5 and other Dragonfly punts. Much work is still to do. It should keep me intrigued for months putting it all together in a Mythbusters style experiment with the other members of the group. Join the fun and welcome to the D-5.